Santo Antão – The island of mountains, wind and water. Many names could be given to the second-largest island of Cape Verde. With its greatly contrasting landscape and soil structures, it forms the northwestern border of the island group with a size of 779 square kilometres. Although the south and west area appear desolate and barren, the subtropical climate will surprise you with its rich vegetation. Forests of fir and pine turn the Ribeira green. You will also see date and coconut palms, mango and carob trees, as well as citrus, almond, papaya and orange trees. Maize, pineapples, coffee and manioc are cultivated in the mountains on terraced fields that consist partly of black lava soil and partly of white "pozzolana". The fragrance of eucalyptus, lavender and even lotus blossoms hangs in the air. Acacia, wild figs and dragon trees line the roads in many places. The nearly 50,000 inhabitants of the island mainly live in the cities of Porto Novo, Ponta do Sol, Paúl and Ribeira Grande. However, the residents of Santo Antão are a mountain people: Despite all of their Cape Verdean joy in life, they also have something raw and heavy to them. This is where the music style and dance of colá is at home. In Ribeira Grande, the vivacious capital of Santo Antão that is located in the valley by the same name, you can discover the Nossa Senhora do Rosário church with a praça of the same name, as well as a food market (Mercado Municipal) and a clothing market (north of the city centre). Although few hotels have established themselves here up to now, a lively mood prevails in the winding lanes with little shops and restaurants. If you would like to spend the night here, small guesthouses offer relatively good service. An Internet café can be found on a side street close to the church. Porto Novo, the next largest city on Santo Antão, is located in the dry southeast of the island. A dusty wind blows constantly here. You can explore the main street with its former mansions, a little church, markets that have local fish, grogue and fresh goat cheese for sale, shops and – of course -- the harbour. 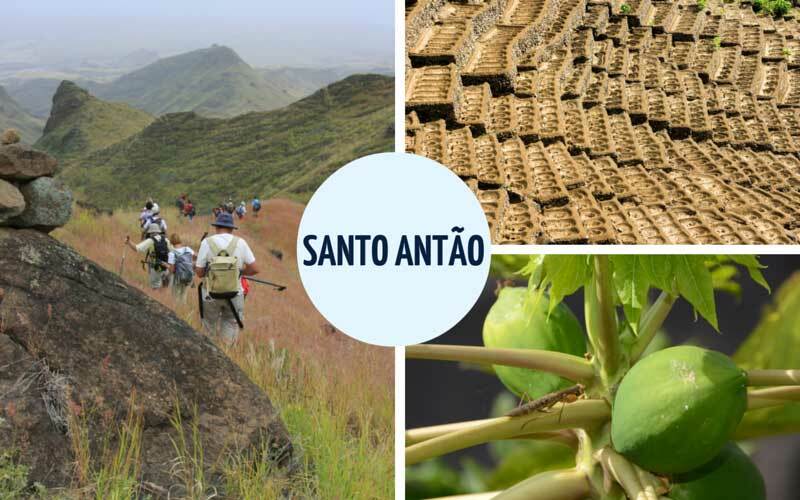 In order to understand the fascinating contrasts of Santo Antãos, we recommend a ride from Porto Novo to Ribeira Grande on the old road. Start in the dry southeast of the island, drive through the vertically towering rock peaks, then past the pine forest near Cova and Corda and along the narrow mountain ridges to the north coast of the island. After you pass the first little village at Lombo de Figueira, you will come to (the foot of) the Cova de Paúl volcano. Its cauldron is situated at the centre of steep cliffs at 1000 metres above sea level. You will have a breathtaking view of the Ribeira do Paúl and the north coast from here. Through the plain of Lagoa (the village itself is very small), you will see how the landscape already becomes much more barren in the west. On the other hand, the plateaus offer a very beautiful view across the island. When the weather is good, you can even see all the way to Monte Verde on the neighbouring island of São Vicente. You will also find an indescribable panorama view around Corda, whose houses appear to grow out of the mountain. Once you have left Corda behind, the trip becomes exciting: You drive on a street that runs across the ridges of a mountain range. The edge of the road drops almost vertically into the depths on the left and right. The new road from Porto Novo to Paúl has also been open since the summer of 2009. This is an asphalt street through a rather dull landscape. Unfortunately, all of the aluguers (shared taxis) now drive on this new street and most visitors to the island miss out on the breathtaking views from the old cobblestone road as a result. If you would like to take the more exciting route, just order a taxi that drives from Porto Novo to Ribeira Grande for about 5,000 escudos (approx. 45 euros). The district of Pául with the coastal village of Vila das Pombas, from where the Ribeira do Paúl extends to the Cova Crater, is located about 10 kilometres east of Ribeira Grande. The little town of Passagem can be found at 250 metres above sea level in approximately the centre of the valley, which is very craggy is some places. A lovely swimming pool has been built here on several terrace plateaus. A narrow road runs from here in the direction of the ocean after 2 kilometres to the rural lodgings of Aldeia Manga, which consists of a number of straw-covered loam bungalows and a large stone house. These are ideal accommodations for hikers, who can start out on and finish many different hikes from here without needing a car. About 2 kilometres further up, there is a nice little restaurant with many interesting homemade products at Alfred’s in Cha de João Vaz. The various liqueurs and grogue variations made by the Austrian who has already lived in Pául for more than 25 years. Vila das Pombas (Paúl) itself is located on a protected bay in the northeast of Santo Antão. Little houses painted in pastel colours, like the light-blue city hall, line the beach promenade here. Behind them are the sugar cane fields and coconut palms – it will remind you of Cuba. The little church and the blue city hall make Vila das Pombas a dreamy place. If you follow the coastal road of Paúl in a northern direction, you will reach the little town of Sinagoga, a former settlement of Jewish immigrants. In a southern direction, the coastal road runs through the Ribeira da Janela. After you pass a grogue distillery that lies directly on the street, you will reach the lighthouse of Janela, which was built in 1886. If you go towards the valley from Pontinha da Janela, you will reach a freestanding rock with petroglyphs (carved drawings) – the Pedra da Nossa Senhora -- after 500 metres. In the western part of the valley of Ribeira Grande, a worthwhile path runs along the Ribeira Graça to the little town of Chã de Igreja, which is picturesquely surrounded by green in a 50-metre deep, steeply sloping ravine. It’s not unusual for villagers here to decorate their houses, which stand around the village square that has a white church, with all types of flowers. You can also reach the little village of Chã de Igreja from Ponta do Sol. When you take this equally interesting route of slopes and ravines, you will pass the scenic town of Fontainhas towering on a cliff. Other sights along the way are the authentic fishing villages of Corvo and Forminguinhas, as well as the town of Cruzinha da Graça on a promontory. The tour takes about five hours by foot. The driveable road street ends at Fontainhas, whose houses that appear to grow out of the mountain are surrounded by terraced fields and steep slopes. From here, it takes two more hours to walk to Forminguinhas. If you follow the street from Ribeira Grande in a northwest direction, you will reach what may be the loveliest town of Santo Antãos, Ponta do Sol in the extreme north of the island. Colourful little fishing boats lie on a promontory, which extends into the Atlantic. The city hall on the town centre’s praça, a comparably large colonial building, appears to watch over everything here. The town’s white church with its beautiful gables is also located on the praça. You can find accommodations in hotels and small guesthouses. Restaurants and bars line the streets. Even the drive from Ribeira Grande to Ponta do Sol is an experience: The connecting road runs directly along the cliffs at the ocean. The second residence of Cape Verde’s current president, a spacious villa with beautiful gardens, is located in Ponta do Sol. The best way to explore the west is from Porto Novo. An expanded road leads to Ribeira das Patas, whose valley is bordered in some places by vertically rising cliffs (primarily near Lagedos). The highest elevation of the island, the Tope de Coroa with its elevation of 1980 metres, is located behind a green area in a western direction. It’s not much further from here to Tarrafal de Monte Trigo, a green oasis on a sheltered bay. The dirt road from Ponte Sul to the interior of the island is quite adventurous, but you can drive there with the aluguer (shared taxi) or rent an off-road vehicle as a taxi (much more comfortable) directly from Porto Novo. A beautiful black lava beach that stretches for many kilometres awaits you there. The Tarrafal, which is very green due to a nearby spring, is protected against the wind in front of high cliffs. There are overnight accommodations in lovingly constructed natural-stone bungalows in a very beautiful, authentic complex (Mar Tranquilidade), which is run by a German-American couple. Life on the very dry island of São Vicente mainly happens in the city of Mindelo, where more than 80% of the approximately 80,000 island residents live. In terms of its landscape, São Vicente is dominated by the mighty Monte Verde peak (750 metres). Together with the two other mountain ranges (the Madeiral and Fateixa), it defines the appearance of the island. From here, you have a good view of the surrounding countryside and the city of Mindelo. On clear days, you can even see Santo Antão and beyond to the uninhabited islands of Santa Lucia, Branca and Raso. However, unlike the promise of its name, the mountain is not green. It consists of reddish-brown scree. 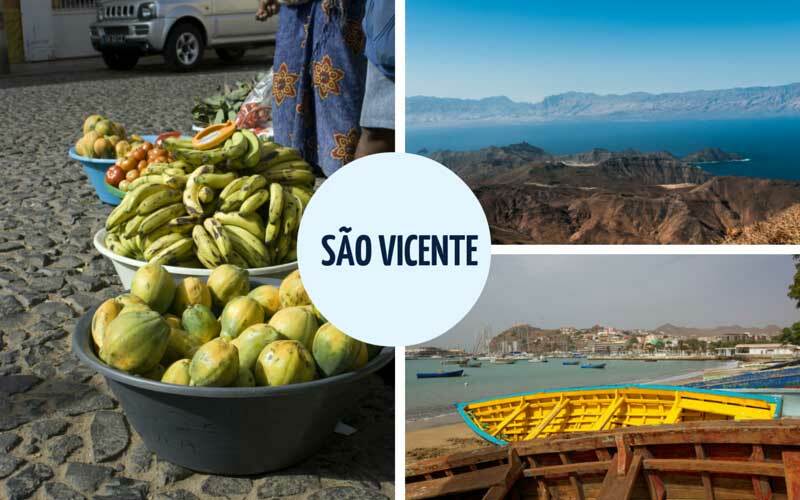 Before the Sahel catastrophe, green beans and corn were grown on its ridges, which probably led to the coining of the name “Green Mountain.”The history of São Vicente is very closely connected with the city harbour of Mindelo. For a long time, Porto Grande was the largest harbour in the Atlantic and therefore the respective economic engine for the entire country. Even today, it’s still very important with its tremendous water depth, even if it’s now less frequented by the international shipping traffic due to the harbours that were built afterwards in Dakar and Las Palmas. Many beggars and street children now live in slum-like conditions in Mindelo, which can be called a melting pot of the cultures, due to the decline of the harbour economy. Nevertheless, Mindelo has preserved its status as the cultural centre of the Cape Verdean archipelago. Because of the many sailors from around the world who were looking for amusement when they came through town, the city became the birthplace of the many, even internationally famous, music styles of Cape Verde such as morna or coladeira. However, you should not expect to find dreamy bars in which traditional music is spontaneously played every step of the way. As a result of globalisation, pop music has long become a part of the scene. Television with the Brazilian Telenovelas has also done its part in encouraging the city’s young people to stay at home in the evening instead of spending their time playing music in the streets. But well-known artists such Baú still perform in the clubs (such as Café Musique) and (also small) restaurants. In addition to the harbour in Mindelo, you can also admire the Mercado de Peixe (fish market), the Torre de Belém (replica of the tower with the same name near Lisbon), the bronze busts of Diego Afonso, the shoreline street with its beautiful manors and, a bit further, the Esplanada or city park. In the Praça Nova quarter, an upscale neighbourhood with a plaza of the same name that has some pastel-coloured villas with stucco, the Quiosque Praça Nova with a lovely Art Noveau pavilion invites you to relax. People generally like to go for strolls here. In this quarter, which seems quite European, increasingly more shops and restaurants are opening their doors – Mindelo pulsates. In the morning, you should visit one of the many classic cafes on the Rua Lisboa, which is now officially called Rua Libertadores d’Africa and, as many people say, is the soul of Mindelo. A market hall and the former governor’s palace in the classical style are located on this street. A visit to the old town, which is situated directly on the ocean and in front of the impressive panorama of the Cara Mountain, is obligatory! This district, which has a very African character with its flying traders, is home to the colonial Nossa Senhora da Luz church on the Praçinha da Igreja and the relatively well-stocked Casa Benefica department store. Further to the south, on the Praça Estrela with a pavilion and a few bars, African traders offer their goods (clothing, shoes and bric-a-brac, as well as fruit and vegetables). There is an Internet café on the Avenida Amílcar Cabral at the Centro Cultural do Mindelo, in which changing exhibitions are also displayed. In the southwest of the island, windsurfers will find excellent wind conditions on the beach of the quiet little town of São Pedro. Surfers will also get their money’s worth at Sandy Beach. However, no corresponding infrastructure has been created yet. You can also go deep-sea fishing, diving and sailing here. There are even charter offers and skippers available. The island airport, which has also been internationally certified since January 2010, is also located near São Pedro. However, it doesn’t cause any real noise pollution due to the limited number of take-offs and landings per day. A beautiful, wind-protected bathing beach (the only one on the island that is safe for children) is situated in the northeast of the island, near the little town of Baía das Gatas. A music festival also takes place here every year in August. Praia do Norte and de Praia Grande, both of which are very beautiful beaches, are located further to the south. But they are not suitable for swimming due to the heavy surf. Only an area of beach in the southeast of Praia do Norte, Praia da Ceilada/Calhau, offers better swimming conditions. In the town of Calhau, a well-groomed weekend village, you can also hear live music in the restaurant. São Nicolau is pure nature. Steep mountain slopes with fantastic rock formation, deserted villages and fertile valleys are waiting for you to discover them on this island of 346 square kilometres. People say that there is a very special mood on this island. It’s ideal for hikers and mountain bikers because its mountains are not quite as high as those on Santo Antão. The highest mountain is the 1312-metre high Monte Gordo in the most fertile part of the island, the northwest. 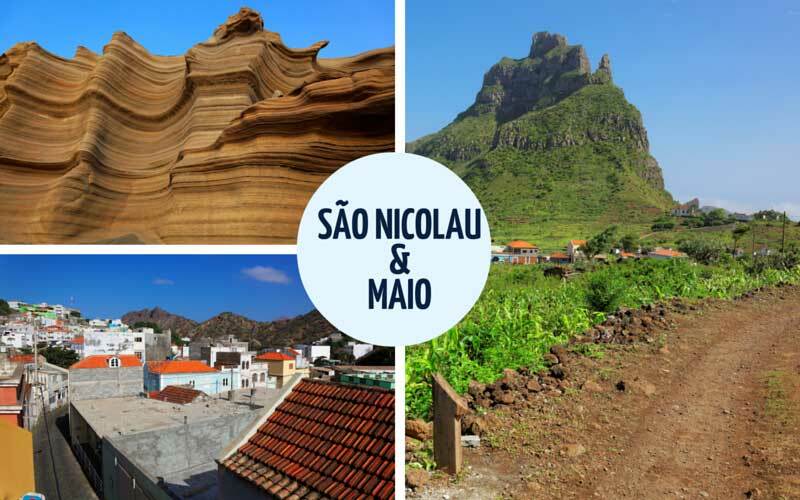 A mountain range of up to 700 metres in elevation, levelling out in a plateau, stretches across the more arid and very sparsely populated east of São Nicolau. The south of the island is also very dry. The coastal areas are generally quite difficult to access, which makes the mountainous island less suitable for those who just want a holiday at the beach. With its picturesque and colourful houses, the capital of São Nicolau, Ribeira Brava, is located at the centre of an impressive mountain backdrop. Above all, the little city is very busy in the mornings. The narrow paved streets are filled and lively trading happens in the little shops with their wooden crates. In 1780, Ribeira Brava was declared as the bishop’s seat. The priest seminar of Seminário de São José, which prepares students for church and government offices, is located next to a chapel. The impressive Cruzeiro de Penedo (cliff cross) rises out of a basalt cliff above the chapel. After the bishop’s seat was moved to São Vicente, the former priest seminar was ultimately closed in 1931 and used as a prison for political offenders. The town centre has the Praça do Torreiro church square with the Igreja Nossa Senhora do Rosário, an impressive building with two towers and blue facades. However, its interior is designed in a very simple manner. The relatively new market hall, where you can buy food and clothing, is situated nearby. A lovely park with benches and flowers for relaxing under the shady trees is located at the riverbed of Ribeira Brava. The pristine nature of the island once again becomes obvious in the São João quarter: Next to the pretty house of returned emigrants, buildings made of natural stone with straw roofs stand here. After 26 kilometres on a very lovely route to the northwest of Ribeira Brava, you will reach Tarrafal. On the way there, it’s worthwhile to take a side trip on the coast in the valley of Queimadas: The Blue Hole, an opening in the cliffs with the ocean surging beneath it, is very definitely worth seeing. Tarrafal itself, which now has more inhabitants than the main city of Ribeira Brava, is the site of the largest harbour on the island, in addition to many shops and restaurants. Tarrafal is also one of the few places on the island with beach access for swimming. Above all, we recommend the Praia da Luz, a wide black sandy beach in the north of the town. The black sand contains titanium and iodine, which supposedly brings relief to joint diseases and rheumatism. You will see a very fertile area in the Fajã Plain. Carob, banana and papaya trees thrive here next to dragon trees. Above all, the latter can primarily be found around the village of Cachaço in the foothills of the Monte Gordo. At the same elevation on the east end of the village, the Nossa Senhora do Monte Sentinha chapel stands solitary on a hill in front of the towering panorama of the mountain with the same name. The three-hour path from Praia Branca to Fajã is considered to be one of the most beautiful hiking routes on the island. The path winds in serpentines along steep mountain ridges, past the twin cliffs and through the valley from Ribeira da Prata into the fertile Fajã plain. Praia Branca, a valley protected by mountains, is also a lovely experience of nature, just like Ribeira da Prata. The latter is lined by sharp cliffs that have little groups of houses built on them. South of the airport, which rarely has planes landing, is the quite destitute looking fishing village of Preguçia. In earlier times, it was still a trade harbour and a major whaling station. The town, which lies directly on a bit of coastline that drops off steeply to the ocean, still has a certain antiquated charm. The east of the island is dominated by deserted houses and towns. Life is evident only in the coastal region with the villages of Carriçal and Juncalinho. A tour of the Capela da Sagrada Familia, whose construction was made possible in 1960 by a Capuchin monk, is worth taking in Juncalinho. When approaching the island of Sal, it seems like you are landing on a golden pearl of sand in the middle of the turquoise-blue ocean. Above all, one thing can be found on Sal: sand. Deserts and dry valleys. But little oases, salt marches and dormant volcanoes also distinguish the appearance of the island. For many years, the island was a centre for salt mining, which is also where the name Sal (salt) comes from. However, the salt is almost only for local use and for tourists by now. The strong trade wind that blows from November to June has turned the island into an Eldorado for surfers. Due to the international airport on Sal and ambitious tourism projects, which have also created jobs, Sal has now reached a population of 20,000 people. Only 10% of these are older than 40 years. The highest elevation on the island is Monte Grande with a height of just 403 metres. The island is very flat on the whole, which is why clouds hardly have a chance to stay above it and there is almost no rain. So: sun, sun, sun… and kilometres of sandy beaches. In Espargos in the island’s interior, location of the international airport and the capital of the island, you can find everything that is practical and important: banks, a health centre, the main post office, a hotel, some guesthouses, bars, Internet cafés and restaurants, and – of course – all types of stores. The harbour city of Palmeira is situated just a few kilometres to the west of Espargos. This is where a majority of the imports and exports take place on the waterways of the islands. Otherwise, Palmeira is a town with bars and restaurants whose architectural appearances still have distinctly Portuguese characteristics, especially in the north. Divers should know that there are fantastic underwater caves and reefs, such as Olho Azul, to explore about 5 kilometres to the north of Palmeira. Above all, the town of Pedra Lume (“fiery stone”) is known for its salt sea (saline), a low volcano crater that lies beneath sea level. Salt mining now exists only to a limited extent with just a few fishermen still living in the small, deserted town. In addition, it’s now possible to enjoy a curative salt bath in the saline at some of the salt seas for an admission fee. Showers are available. The city of Santa Maria has developed in a lively way. It has large, luxurious hotel complexes where guests can expect European standards, including animation, various evening and sports programmes (diving, surfing, waterskiing or riding courses) and much more. This has its reasons: With its many kilometres of beaches that are up to 200 metres wide, Santa Maria probably offers the most ideal conditions for a classic beach holiday. The landmark of the town with its small restaurants, stores and little pastel-coloured houses is undoubtedly the weigh house on the old harbour quay, where salt was weighed in earlier times and now is the site of souvenir shops. You can still observe the fishermen as they bring in their catch and clean it at the harbour quay, just like in the past. The easternmost and third-largest island of Cape Verde definitely does justice to its name – Boa Vista: beautiful view. While mass tourism has already reached the smaller neighbouring island of Sal, life on Boa Vista is a bit more authentic. However, the international airport was opened in 2007, and Italian and Spanish investors have discovered the island and are building hotels. 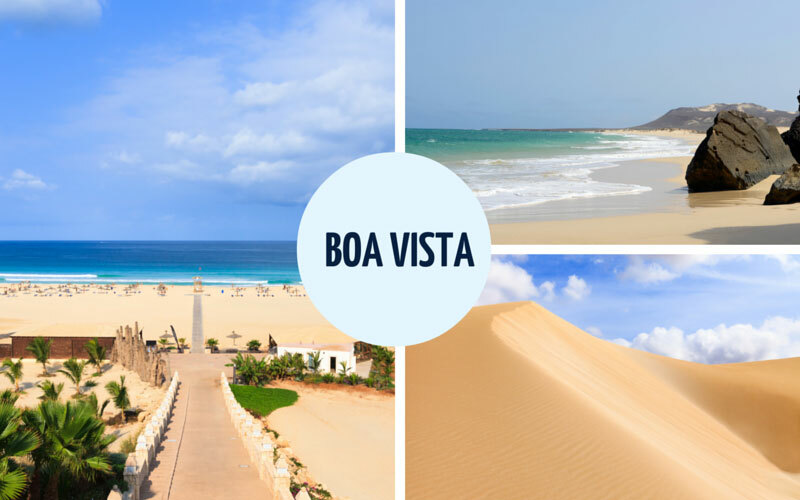 People familiar with Cape Verde assume that Boa Vista will be serious competition for the island of Sal with regard to tourism in a few years. The landscape here is also characterised by deserts of sand and scree. Yet, there are also a few low mountain ranges – and, of course, many beaches (55 kilometres), much sun, the sea and excellent conditions for water athletes. The capital of the island of Boa Vista, Sal Rei, looks quite cosy and almost sleepy, even though more than half of the island’s 12,000 inhabitants live here. On the main plaza, the Praça de Santa Isabel with its many colourful flowers and pavilions, you can admire goods sold by the African traders. Colourful batiks and carved wood figures, as well as fruit and vegetables, are sold here. Sal Rei also has a travel agency, a health centre, a bank and a post office. The Igreja da Santa Isabel, which stands directly next to Praça de Santa Isabel, was built in the colonial style and decorated by a Baroque facade in shades of sand and light blue. Along the ocean, on the Avenida dos Pescadores, you can tour the old harbour quay and a boatyard. Directly across from it, you can see the little island of Ilheu de Sal Rei in the open sea. Further to the north, Avenida dos Pescadores is lined with trees and dreamy colourful little houses in every possible colour stand at the edge of the street. The salines, in which the royal salt (Sal Rei) of best quality was once produced, are located to the northeast of the city. If you drive a bit further, you will recognise the ruins of the Nossa Senhora de Fátima chapel above the rocky coast. 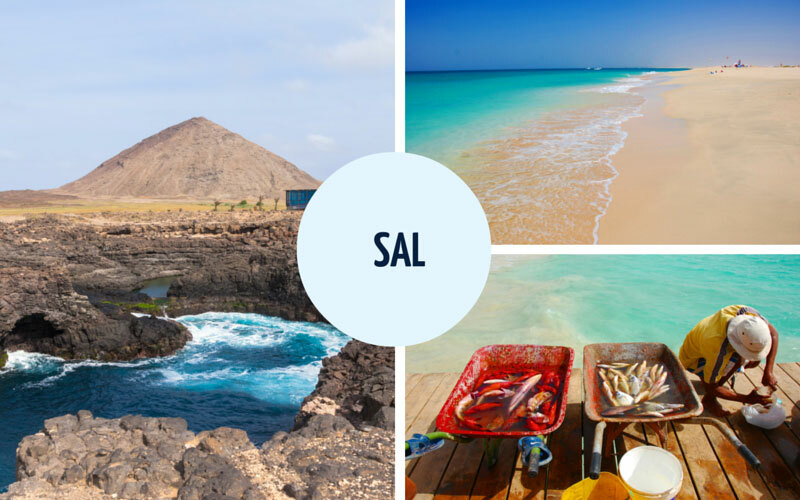 The bays of Sal Rei are perfect for swimming because they are protected against the wind by the island of Ilheu de Sal Rei, which is located offshore from it. We highly recommend the kilometre-long sandy beach of Praia do Estoril to the south of the town. In addition, the Praia de Carlota and the Praia da Chave are in the south and the Praia de Cabral is in the north. In Rabil in the southwest of the island, you can visit a little pottery workshop and the São Roque church. Otherwise, the village makes a rather deserted impression. In the direction of Estância de Baixo, a small oasis with coconut and date palms is located in the valley. The oldest settlement of Boa Vista, which was built about 500 years ago, is also in the southwest: Povoação Velha. The little plaza Praceta de Santo António with its flowers and benches to rest on is at the heart of the town. The playful little Igreja Nossa Senhora da Conceição church, which was built in 1828, is on the outskirts of town. Its interior is decorated with a colourfully painted chancel that has numerous little images of saints. The Praia de Santa Monica in the south of Boa Vista is considered the most beautiful beach of Cape Verde. You can also see Maio and São Nicolau from the Rocha Estância (354 metres) observation point. The east of the island is so solitary and deserted that you won’t see anyone at all in some areas of it. The Fundo Figueiras district in the hamlet of Norte has a pretty little church, Igreja São João Baptista, with white and pastel facades. The little houses are very colourful. The lonely beaches in this part of the island are more suited for long, quiet walks than swimming. Unfortunately, the number of robberies on the island has increased together with the rapid development of tourism. You should never take long walks on secluded beaches by yourself. It’s always better to go in a group. As on Maio and Sal, you can observe sea turtles laying their eggs on the beaches. Many species are already threatened by extinction, so the Turtle Foundation has set the goal of protecting these valuable animals from being slaughtered despite the ban and defending their nest of eggs against human robbers. 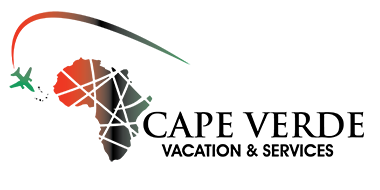 They have also been strongly supported for some years now by the government institutions (INDP) of Cape Verde. This has also resulted in growing success for their efforts on behalf of these increasingly rare sea creatures. Yet, there is still much to do in order to also anchor the need to protect the sea turtles in the minds of the residents. Public awareness programmes are also being offered in this respect. Welcome to the biggest island of Cape Verde! With its capital of Praia in the southeast, Santiago has had a strong influence on the history of the archipelago. More than half of the Cape Verdeans now live on this island. 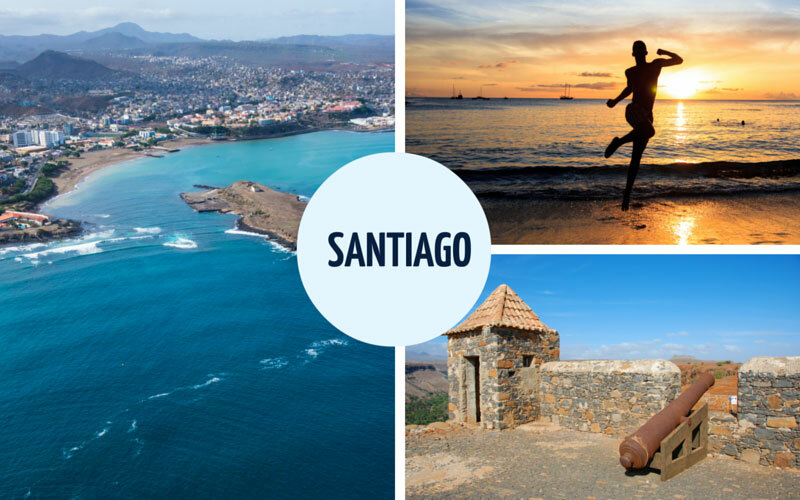 With an area of 990 kilometres, Santiago is probably the most diverse island in terms of its landscape. You can find fine sandy beaches, mighty mountains and dry steppe areas, as well as fertile valleys and plateaus. In a valley near Assomada, in the island’s interior, you can admire the oldest and largest tree of Cape Verde, a kapok tree that is about 500 years old and 40 metres tall. Two volcanic mountain ranges dominate the structure of the island: The arch of the Serra Malagueta (1394 metres) runs from the west coast to the east in the north; at the centre of the island, a mountain range stretches around the island’s highest peak, the Pico d’Antónia. The two monuments of nature are surrounded by achadas (plateaus) and flat-top mountains of lava rock. The achadas in the interior of the island display rich vegetation: Acacia, euphorbias and figs are very common here since the soil is comparatively moist. In the north and south, the plateaus are much more barren and crossed by dry valleys (ribeiras). The island has been very strongly influenced by Africa in terms of its culture. After all, it was the centre for the slave trade with the neighbouring continent for many years. The classic music styles such as funana and batuco, which are present everywhere, are a potent reminder of this fact. With its roughly 100,000 inhabitants, the capital of Praia pulsates and grows. This is the governmental and economic epicentre of the country. But slums that are reminiscent of Brazil‘s favelas and suburbs with multi-storied concrete buildings also dominate the cityscape. Praia is busy, loud, hectic -- a typical big city. Businesspeople, diplomats (at home in the Prainha villa quarter) and the government officials bustle about in the centre, and 10,000 commuters descend upon the city every day. Even if Praia is less tourist-oriented, it still has some attractions for you to discover: The core of the old town, which is built on a plateau, with its magnificent houses from the colonial era and the Praça Alexandra de Albuquerque. The Nossa Senhora da Graça church, the food market, the palace of justice, the Museo Ethnográfico, the presidential palace, the parliament building in the Achada de Santo António section of the city, and the old town fortress of Bateira, from which you can enjoy a wonderful view of the ocean. The best city beaches are the Praia Prainha or the Quebra Canela, which is close to the Prainha quarter. The Praia da Gamboa, which is not recommended for swimming, is the site of the island’s latest music festival, which takes place once every year. The Achada de Santo António quarter, located on a plateau in the west of Praia, is where you will find bars, restaurants and nightclubs. It’s also worthwhile to visit the Mercado de Sucupira with its labyrinthine side streets in the Várzea quarter. This is where you can buy everything from clothing and African fabric to household appliances to music and traditional handicrafts and the typical national dishes. Cidade da Ribeira Grande de Santiago, the former capital of Santiago (previously called Cidade Velha), was placed on the World Cultural Heritage list by UNESCO in July 2009. The city is overlooked by a mighty fortress, Fortaleza Real de São Felipe, which serves as a reminder of the Portuguese colonial rulers. The romantic little houses of Rua Banana, which also display architecture typical of Portugal, were rebuilt true to the original within the scope of a UNESCO project. The fact that the Cidade de Santiago was the centre of the international slave trade during its heyday, when it was still called Ribeira Grande, is attested to by the pillory (Pelourinho), an obelisk close to the city centre. The Nossa Senhora do Rosário church, whose construction began in 1495, is enthroned above the northern part of Rua Banana. With its baptismal of alabaster, it’s the oldest colonial church in the world. Above all, the monument‘s baptistery is worth seeing. The floral motifs in stone in the latticework vault of the chapel are evidence of Moorish influences, as are the numerous azulejos (painted tiles). The Convento São Francisco, to the north of the city centre, is also worth visiting. Directly on the coast, the ruin-like Sé Catedral lies elevated above the sea. Started in 1555 and only completed in 1693, the rather simple church in the Mudéjar style is full of history. Its construction plans were frequently changed, and it was partially built of limestone and partially of basalt quarry stones. You can spend a classic pleasant Sunday in Tarrafal in the north of Santiago. A pretty little bay with palms is protected from the wind and quite suitable for swimming. You can watch the boats arrive at the small fishing harbour (divers and deep-sea fish will get their money’s worth due to the many species of fish). Once a week, there is a market on the church plaza and you can also tour an old Baroque church. The surrounding mountains invite you on a hike. Fogo means fire. And this name reveals the true nature of the island in the Sotavento with its approximately 40,000 inhabitants: a volcano. 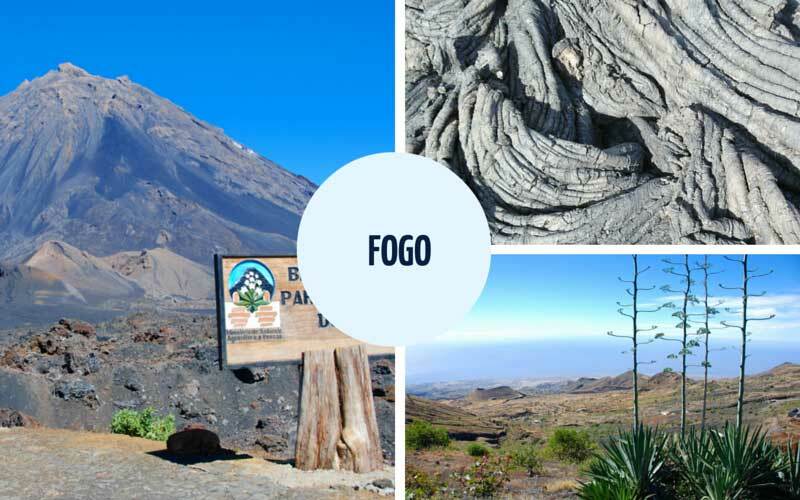 Rising up to 2,829 metres, the volcanic mountain of Pico de Fogo dominates the island’s landscape as the highest elevation of Cape Verde. You can enjoy a beautiful view of Pico from the old craters located to the west that surround the mountain in a semicircle and form the caldeira (gigantic crater) with a diameter of 9 kilometres. With its diameter of 500 metres, the main crater of the volcano achieves a depth of 180 metres. Even today, it still spews sulphur vapour through hot fumaroles in an impressive spectacle of nature. Due to the high mountains on Fogo and the corresponding formation of clouds, the island tends to be damp. As a result, many different types of useful plants thrive on the terraced fields. On 1 May, the inhabitants celebrate the discovery of Fogo with the Festas do São Filipe and its horse races. The best way to start the climb to Pico de Fogo is from the little town of Chã das Caldeiras. The path takes about six hours from here – after all, there is a 1000-metre difference in elevation to climb. Good footwear is absolutely necessary due to sections of the route that are steep and others that pass through fine scree (volcanic ash).The largest city of the island, São Filipe, is located to the west of Fogo. With about 20,000 inhabitants, it’s the fourth-largest city of Cape Verde after Praia, Mindelo and Assomada. This is also the site of the island airport, which is served solely by domestic flights and only offers connections from and to the other islands as a result. On kilometres of coastline with black lava beach, the picturesque little city rises about 100 metres above the high, steep coast. The Alto San Pedro, a long plaza, separates the lower city (Vila Baixo) from the upper city (Vila Riba). You can take a taxi from the marketplace, which is hustling and bustling every morning, to the volcano crater. The lower city is the site of Praça 7 do Decembro with the city hall and the magnificent town houses (sobrados) of the once rich families. Somewhat below this plaza, the Nossa Senhora de Conceição church with its beautiful light-blue painted facades and little colourful houses are situated on a little pracinha. You can reach the beach from the city by taking the stairs. In any case, we recommend the southern section of the beach, which can be reached via the stairs on the left because it’s much cleaner than the beach directly beneath the city. However, you should go to other beaches (Ponta da Salina) for swimming since the currents can be treacherous; swimming can also become dangerous here, especially during a swell. Otherwise, we recommended the Porto de Vale de Cavaleiros beach, which is located three kilometres to the north of the city.Leaving São Felipe in a northerly direction, you will come to São Jorge and Las Salinas by following the east coast. Two ring roads represent the island’s network of streets. One route runs at an elevation of about 300 metres above the ocean. Except for the little turquoise-coloured houses at the centre of town, São Jorge makes a rather deserted impression. But you should be sure to drive to Ponta da Salina, an ocean swimming pool surrounded by cliffs with a natural rock gateway that reveals a view of the ocean and offers the most beautiful opportunity for swimming on Fogo.When returning to São Filipe, be sure to drive on the higher road with its very interesting views of the landscape. You will see volcanoes directly on the ocean, colonial manors and much more. The south and east of the island offers the town of Cova Figueira with its colourfully painted little houses. You can experience an agriculture idyll on the route from Cova Figueira to São Felipe. In this unspoiled area, you will see volcanic cones and wild figs. Once you reach the little town of Mãe Joana, you can finally enjoy a very stunning view of the surrounding volcanoes. It’s also worthwhile to drive in the direction of Mosteiros from Cova Figueira. Now that the airport has closed, this turned into a dreamy village situated directly on the ocean. The drive takes you along a steep rock face that is 500 metres above sea level. After driving through the green landscape, you will pass by fruit trees in the town of Tinteira with its dark houses built of lava rocks.In the very north, you can get to know what is possibly the most traditional lifestyle on Fogo in the village of Ribeira Ilhéu with its little antiquated workshops. Even if Brava with its capital of Vila Nova Sintra is the smallest populated island of Cape Verde, you should not underestimate it: A visit (especially shortly after the rainy season) is rewarded with a sea of flowers. Due to Monte Fontainhas (976 metres) and the location in the slipstream of Fogo, clouds form throughout the entire year above Brava. Thanks to the dew, this creates a plant-friendly climate. On this tropical moist island, date and coconut palms thrive just as well as the colourful oleander bushes, species of hibiscus, almond trees and bougainvillea. If you are looking for a change of pace from the mostly desert-like islands of the Barlavento, this is exactly the right place for you. 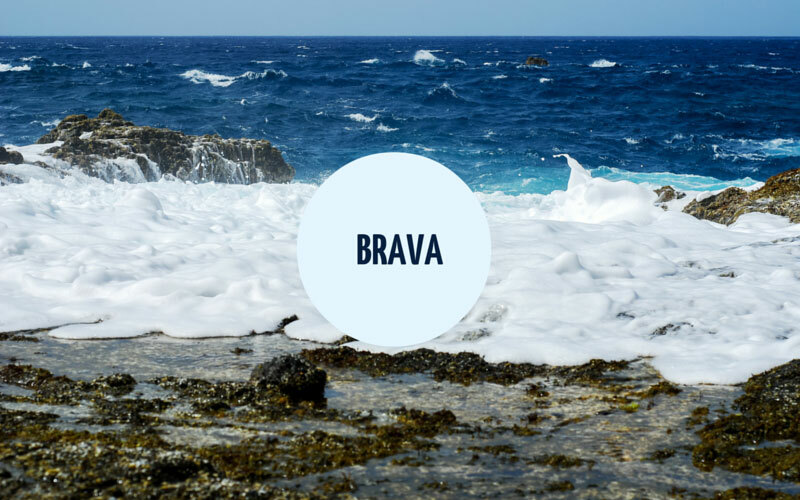 Many people think that the town of Vila Nova Sintra, located high on the mountain ridges of Brava, is the most beautiful city of the Cape Verdean archipelago. The sobrados (two-storied houses) with little gardens reveal that the financial circumstances in the city are not quite as meagre as on some of the other islands. Next to the Praça Eugénio Tavares (named after a morna musician born on Brava), you will see the Nazarene church and the colonial Igreja São João Baptista. You can reach the market from Praça Eugénio Tavares in a southern direction. The eastern entrance to the town of Vila Nova Sintra is guarded by the stone replica of the Columbus ship Santa Maria. On 24 June, the people celebrate Midsummer’s Day around the monument: The women of the city decorate Santa Maria with flowers, fruit and baked goods. They also do the traditional cola, a boisterous dance. The men of the island are usually dressed as sailors, and the children of Vila Nova Sintra are allowed to take the ship decorations home with them at end of the day. A few kilometres from Vila Nova Sintra in a southeastern direction, the street passes Mirador de Nova Sintra (from which you have a beautiful view across the city) to the two little villages of João d’Nole and Mato Grande. In João d’Nole, a picturesque small town with many little fruit gardens and well-kept houses, you should definitely visit the Igreja Santa Antão. It’s located on a hill above the city and stands at the centre of a green, mountainous landscape shrouded in fog. It appears to defy nature, looking as if it has become part of the mountain and merged into the landscape with its crumbling turquoise facades. Mato Grande offers a wonderful view across the entire east coast of Brava. You should also head to the northwest coast from Vila Nova Santa. The street winds between the fields and meadows. Hibiscus hedges line the road, just like the impressive rubber trees and even a dragon tree (in Cova Rodela). You will reach the town of Rodela Baixo, which is situated on a rocky headland. It’s worthwhile to hike from here to Fajã de Água, which lies on one of the most beautiful bays of Cape Verde. On the way there, you will pass a bizarre landscape of steeply rising cliff walls, deeply sloping valleys and terrace fields. You will find the picturesque little town of Cova Joana in the south. After a few more kilometres, you will reach the very secluded settlement of Nossa Senhora do Monte. As its name implies, it’s located directly on a mountain. You can see Alto de Fontainhas (976 metres), Brava’s highest mountain, from the neighbouring village of Mato. The barren landscape even further to the south is home to the very traditional little village of Cachaço. When the weather is clear, you can see all the way to Fogo from here.